They say the Dart claims a life every year. Well it claimed a life this weekend - that of a canoeist. 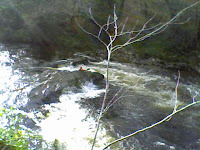 He was trapped between his canoe and a tree on one of the most inaccessible sections of the river, below Mel Tor. The Dartmoor Rescue Team had to walk for hours, climbing down into the gorge, to bring him out on a stretcher. Today the river was still boiling with rage. Tor Bay has always been a place where ships shelter. Today, despite all the gales, it was serenely calm, and there was a magical sense of otherworldliness, a paused dimension, as we entered the water. We swam from Elberry Cove to Broadsands, past a series of crinkly, pointed rock formations that looked as though they should be home to mythical creatures. My very knowledgeable friend Sue tells me they are the fossilised remains of corals which grew here 360 million years ago, when the sea was shallow and tropical. There were caves and little inlets and channels to swim through. It felt like another kingdom. A big storm has been rampaging through Devon. Roofs off, fallen trees etc. Perfect conditions for kite flying. 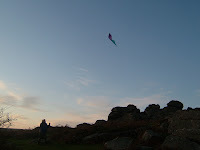 We headed for Bonehill Rocks on Dartmoor. The kite was alive. Here, there and everywhere it went; at one point I nearly got decapitated as it zoomed down in a kamikaze nose dive. The 'shroom season has been a little disappointing. It started in a rush of excitement at the end of August, with lots of chanterelles, but the Indian summer, lovely as it was, stopped the fungi in their tracks. The good news though is that the hedgehog mushrooms go on for much longer than most. 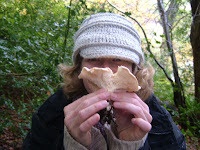 Today my friend Amanda (shown with handsome specimen) and I took a fledgling forager out to 'show her the shrooms'; fortunately we managed to sniff some out.